Are you planning on taking the Kedarnath Yatra? If yes then make sure that you are equipped with the right knowledge about your destination which will take you through one of the most spiritual and holy pilgrimages of 16 kms to this holy temple. This guide will allow you to enjoy the Yatra journey in complete comfort and allow you to have a tranquil experience. Here is a detailed guide to a journey of a lifetime that will make your Yatra even more easy and joyous. In case you are planning to reach Kedarnath via a road journey then you will be required to book a taxi or bus service that are run privately by the GMOU ltd. In order to reach Kedarnath Dham from Delhi you will be required to first reach till Dehradun either by road, train or by air. From Dehradun you will be making your way to Haridwar and from this holy city you will be taking the route heading for the path leading to the Kedarnath trek. You can also make your way to Kedarnath Dham by taking a direct bus from the bus stand at Kashmiri Gate in Delhi that will drop you to Gaurikund. These services are run on a regular basis by the Uttarakhand Transport Corporation. Once you reach Gaurikund you will be completing the journey on foot via trekking up to the main temple of Kedarnath. In case you decide on taking up the Kedarnath Dham yatra journey by air then you have the option of availing the Kedarnath helicopter yatra service. This service can be undertaken from Dehradun, Haridwar as well as Rishikesh. From Dehradun – You will be travelling till Sahastradhara helipad at Dehradun from where the chopper service will drop you till your final destination within 40 minutes. From Haridwar / Rishikesh – I case you decide on travelling to Kedarnath from the holy cities of Rishikesh / Haridwar via a helicopter journey then you will be travelling from Haridwar / Rishikesh to Phata via a taxi service which will be covering a distance of almost 200 kms. Once you make your way till Sonprayag you will be required to travel in a shared cab that charges Rs. 20/- per person and is one of the cheapest ways of travelling. 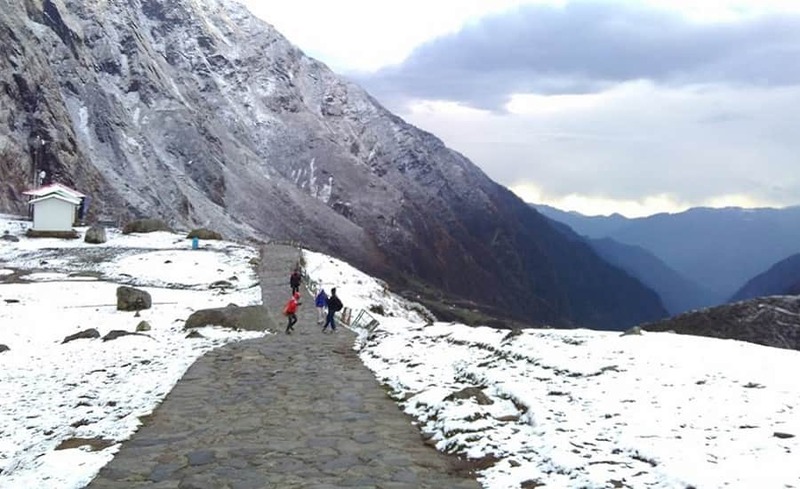 This shared cab will take you to Gaurikund and once you debark at Gaurikund your trekking journey to Kedarnath will commence and given below are the detailed directions for Kedarnath trek. The trekking journey to Kedarnath is an overall distance of 16 kms that starts from Gaurikund and concludes at Kedarnath Dham. The trekking routes had changed and rebuilt ever since the sudden and devastating flash flood disaster had hit this region on 2013. The 16 kms of the trekking journey to Kedarnath Dham commences from Gauri Kund. Earlier, prior to the disastrous flood, the trekking route had made its way through Rambara which was well developed with strong fencing and properly facilitated routes. 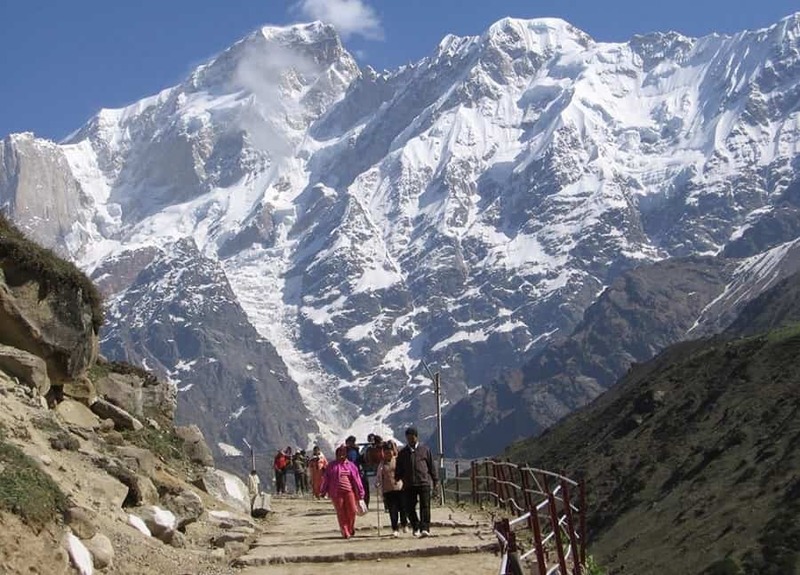 However, now the government has made changes in this route leading up to Kedarnath Dham by creating a new trekking trail and now the old trekking route is now completely erased. 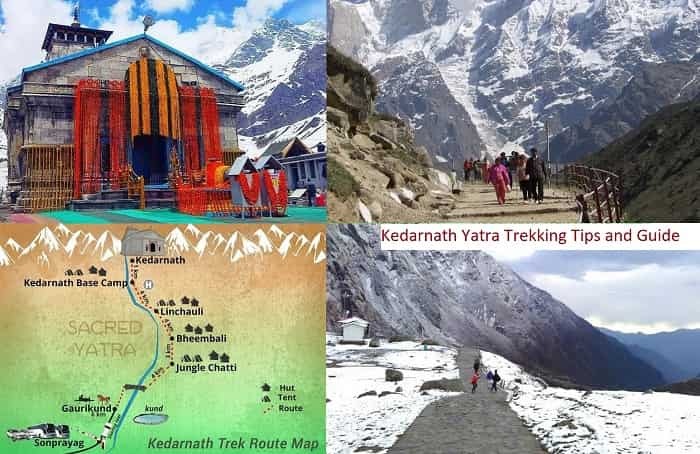 The 16 kms of trekking distance that leads up to Kedarnath temple requires the pilgrim to be tough and a good level of physical fitness therefore, prior to commencing the trekking journey each pilgrim should get themselves properly checked up and get to know if you are eligible to complete this trekking journey or not. 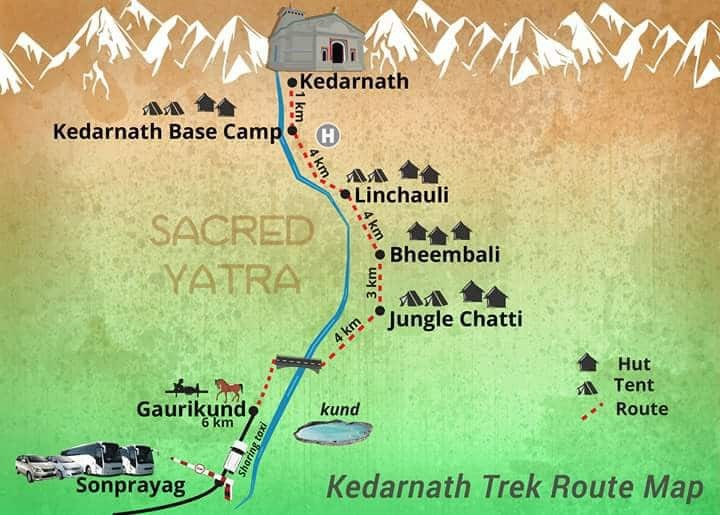 The Kedarnath trek from Gaurikund starts at 4 am early in the morning and goes on till 1:30 pm in the afternoon and these timings are fixed since Kedarnath Dham is located inside the Kedarnath wildlife sanctuary and this is the reason why pilgrims are not allowed to trek any time after this. After the said time no pilgrims are allowed to leave. Since this trekking journey is high altitude and it is advised to the pilgrims who are suffering from respiratory problem should consult the doctor prior to taking up the trekking journey. The Kedarnath trek is equipped with a number of facilities and services like Palki or Doli, Kandi, and mules or ponies that serve as alternate methods of travelling to main Kedarnath Dham. People can book these services at various booking counters at Gaurikund or Sonprayag. The cost for the services differ with distance covered for example – a Palki service from Gaurikund to Kedarnath will cost around Rs.4,450/-, a kandi service will cost you around Rs.3,350/- and a pony journey will cost you around Rs. 4,100/-. Amidst this entire trekking journey there are various proper services available in the form of tented accommodation, clean drinking water as well as small shops, restaurants and Dhabas. Helicopter services are also available from the helipad at Kedarnath to the helipad at Phata and others. Prior to going on Kedarnath trek you should get a complete medical checkup done. People suffering from respiratory disorders and high BP problems should not go on this trekking journey to Kedarnath Dham. In case you decide on travelling to the Dham via a Kandi, pony or a palki then make sure that all your bookings are done way before hand at the booking counter present in Gaurikund or Sonprayag. The pilgrims are permitted to trek only between 4 am and 1:30 pm as per the government rules. In case you have some time constraints and you won’t be able to cover the entire trekking route then you can take the services of palki or ponies to get to your destination. You also have the option of staying in camps or tented accommodation that are present along the trekking routes of Jungle Chatti, Bheembali and Linchauli for the night and you can start your journey, early in the morning next day. Gaurikund is the place from where you can hire a palanquin or a pony service to kedarnath which can be availed by paying a fixed rate to the porters directly which will cut down on your walking journey. If you hire some alternative travel options form someone other than the government approved ones then make sure that they are registered with a government number. Per pony only up to 10 kgs of travel luggage is permitted and in the same way only 5 kgs of luggage is allowed in Helicopter services in kedarnath. This is done to regulate the weight distribution and make the journey eventually a comfortable experience for you. Remember that the temple is situated at a height of 11,000-12,000 feet above sea level and it is not a good idea for people suffering from respiratory or heart diseases to make the journey due to low oxygen levels in the air there. You can choose to make yourself fit for the journey by practicing pranayama, breathing exercises, yoga or other forms of physical activity to prepare yourself for these difficult conditions. At all costs avoid wearing sarees for the journey since it will definitely cause a hindrance to your holy journey. You can choose to wear salwar kameez along with a good pair of sneakers and spots shoes which will make your walking comfortable and you will be able to cover larger distances this way. Remember while trekking to Kedarnath not to tire you out or exert yourself too much. Do not lose your breath while walking and halt if you think that you are experiencing shortness of breath. To deal with this you should practice the famous breathing of Anulom Vilom on a daily basis till the commencement of the journey. You will definitely get hungry on your way which can be dealt with if you are carrying some packaged food items or dry fruits along with you. The routes are also lined with food stalls and eateries from where you can acquire drinking bottled water. Honestly speaking, the trekking journey will be extremely testing if you are not physically prepared for the journey. You should work out every half n hour at least 3 to 4 months before the commencement of the journey. But if you are in shape and love nature then your Kedarnath yatra experience will be extremely rejuvenating. For me, the journey was fairly difficult and it in fact reminded me to work out a little bit every day. The facilities here were helpful for the pilgrims and the routes were also well built that ensured I was kept safe and secure throughout the journey. This trekking guide lets you analyze the entire trekking to Kedarnath situation and make your journey even more enjoyable and comfortable.